Modern society and our educational system has little or no understanding of the underlying spiritual fabric of our existence on all planes across all space-time.... Ancient shamanic teachings which are still practiced and followed by a few people in our world today beckon us to awaken to our deep connection with all there is .. to go beyond our fears of the spiritual realms and to understand our true nature, as consciousness ... divine and omnipresent. The word Shaman is an English translation of the Tungus word Saman. The Tungus are an indigenous people of Siberia located in the Altai Mountains. The literal translation of the Tungus word Saman, means, “To know”. Other research indicates that the word Shaman was derived from earlier peoples, perhaps even the Vedic people of northern India. One such example is that the Tibetan word for a Buddhist monk is Samana. Regardless of the words true origin, it has come to represent on a global level all that practice Shaman like techniques. These invaluable Shamanic teachings, known as The Four Insights, were kept under wraps for a very good reason. The Laika realized that this knowledge about our capacity to manifest our dreams is tremendously powerful, and could be easily abused by those lacking ethics. Nevertheless, these devoted “Earthkeepers” recognized that the Four Insights belong to all people on the planet, not just to the Inka. When they met a white person who did not possess the arrogant, hostile mindset of the conqueror, they were willing to share their wisdom teachings for dissemination to the world. The wisdom of the Laika Shamanic Teachings consists of Four Insights, each of which has four practices that allow us to move beyond mere understanding to actually experiencing shifts in perception that help us transform ourselves and our world. Through the Four Insights, you’ll learn that there’s a spiritual solution to every problem you encounter in the physical world, in your mind, and in your soul. You’ll learn that you can’t eliminate scarcity in your life by getting another job. You can’t heal feelings of abandonment or anger by understanding your childhood wounds. You can only fix these problems at the level above the one in which they were created. When we shift from one level of perception up to the next, we retain our ability to function at the lower realm, but we still retain that wider view of what we’re experiencing. Einstein said, “Problems can not be solved at the level at which they were created.” Being able to shift to a higher realm of perception can help us to find solutions to our problems, resolve conflicts, heal disease, and experience oneness with all of creation when, before, we were experiencing distress and separation. If you want to begin living your life differently and perceiving your experiences through new eyes, it’s important to go beyond mere understanding of the insights and actually follow their practices. Taoism has its roots in Shamanic Teachings. As a result this means the Personal Tao site also offers a collection of spiritual teachings to help people explore a modern Shamanic Life. Experiencing the movement of spirit is something that goes beyond physical words. The materials on this site are just a starting point for people on their spiritual journey. While modern culture has many preconceived notions of what a Shaman might look like, it turns out shamanic teachings are much more varied than what people think. Shamanic teachings are not out of place in this modern world. In fact, the exact opposite is true, shamanic teachings offer tools to help a person find a healthier lifestyle and perspectives that balance the sensibilities of a modern life. Many different “maps” and paths exist in shamanic teachings. Julie and Casey help shamanic students access and then begin exploring the spiritual aspects of life. We first teach a person a larger overview of Shamanism. Then based on a person’s nature, help each person focus down a path that matches their soul. Spiritual activities appear magical to many, since in perspective how we see spirit varies so much from person to person. Yet no one can deny the larger mysterious universe that goes beyond our day to day stories of life. This larger reality around our physical base essence is what is known as “Spirit”. It’s the desire to move with connection to spirit and explore the spiritual worlds that calls to us in shamanic practice. Shamanic practice is an art of lifestyle that connects a person’s heart back to nature and to the roots of our history. Shamanism is the art of helping each person connect to and expand their life with spiritual exploration. How do Shamans perform their Work? 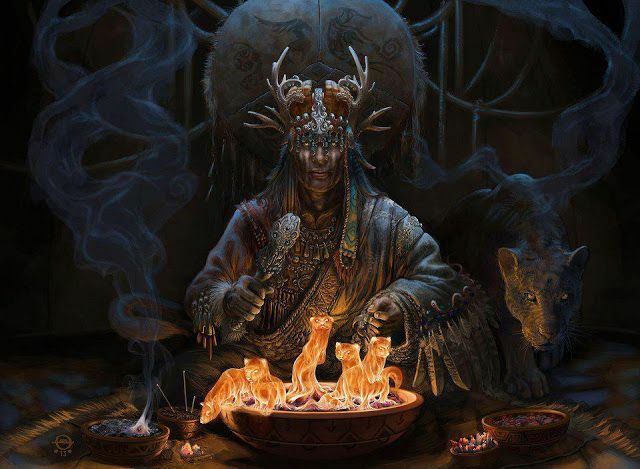 Shamans primarily perform their duties on an energetic level, meaning that they take into account a “mind, body, spirit” connection when performing their work. The basis of Shamanic technique is to honor the life system as a “whole”. Instead of addressing challenges as a symptom, a deeper cause for that symptom is sought. Many times it is a matter of speaking to the patient to identify direct life factors that play into a particular problem. A Shaman may very well provide practical counsel; however the treatment is centered around performing energy work and ensuring that the patient is provided support for on non-physical levels of reality. Shamans utilize several techniques to perform there work. Some of the more common techniques are journeying, chakra based and dimensional energy work, meditation, counseling, performing ceremonies, and entering altered states. Journeying is leaving "this world" reality to enter the "Otherworld" while in the altered state of “ecstasy”. It is the actual traveling through the various levels of the Worlds: Siberian Shamans have 9 levels and usually travel on the back of a goose or a horse. American Indians have 3 levels and travel in accompaniment with their totem guides. African Shamans, depending upon the tribe have multiple layers of the Otherworld and travel with their ancestors. Although each culture has their own methods of traveling they all have some kind of journeying to the Otherworld. What is a Guided Journey? A guided journey is a learning journey. It does not necessarily have to begin with the ecstatic state; often it can take place in deep sleep or in a guided meditation. A guided journey occurs when a spirit guide or animal guide (totem) takes control of the dream and "guides" you to where they want you. A guided journey is not always pleasant. This is where the Shaman learns more about him/herself and grows into their powers, it is where they meet and grow to know their guides and spirit teachers. It is also where they face their fears and overcome them so they are able to journey into the Otherworld and battle spirits. What are the Principles of Shamanism? All power comes from within - (We are all equally connected to our source). Everything has power and all power is equal. Just the levels of which the person can control the power makes it look like some are stronger than others. Power comes from authenticity. This means you must have faith or trust in your own authority/ability. In other words be confident. One must be grounded and centered. It is very important to understand that your personal power comes from within and it is not outside of yourself. Everything is relative and connected – (Microcosm / Macrocosm – Interconnectedness is truly universal). In other words, cause and effect. You can not do anything without it affecting something. Positive thoughts and energy have positive results. Negative thoughts and energy destroy positive results. Example: If you attempt to control a force of nature/spirit world it will rebel. Nothing likes to be controlled. You need to learn to work as an equal partner with all. Man, nature, and the spirits are all connected for we all are all made of power. This reflects upon your ability to use your power to understand that there are no limits to what you can do. In other words, the Shaman that says I can do this is the one that can. Effectiveness is the yardstick of ability – (Self assessment and introspection are a key foundation and life is about building a sustainable foundation of practice). If you make it happen then you have gained the skills to make it happen. Just because you couldn’t make it happen doesn't mean that it can't happen. It only means you may not have found the right way yet. Do not get down on yourself just because you have not yet accomplished something. There are 4 aspects of balance. These are mental, physical, emotional, and spiritual. This means not going over board in any area of your life. At times, tunnel vision can be an asset but only for the duration of the need. It is important to learn not only how to be balanced, but how to balance those you are healing. Shamans endeavor to heal all aspects of the individual. This is how we process energy with our conscious thoughts. Shamans need to understand how the person gets information and how certain information affects the person. Criticize someone too much and all they hear is that they are a failure. Tell them that they are doing better because of the results you see, and they will assist you in helping themselves heal even faster. This is how we process energy with our bodies. This reflects how we take care of ourselves. A healthy body allows the Shaman the strength to journey. You may be thinking I journey with my mind, which is true, but all is connected, -everything affects everything-. We need to reach high levels of physical strength and stamina to journey to the Otherworld and do the healing we are here to do. This is how we process energy through our reactions to others. We all let others effect how we react, though we are the ones in control of how we react. First impressions are a good example: most know right away if they like someone or not. But what most don’t think about, is why we don’t like them? We need to look at the whys. You will usually see yourself in there someplace. This is the processing of the energy of our souls or spirits. Sometimes this is the strongest and least controlled energy in our four energy system. Spirituality is living in harmony with the 4 points of the medicine wheel, which represents your material life, as well as your non-material life. It is believing in something that is greater than a single human body. It is also everything we believe without affixing labels to them. How Does One Learn to Become a Shaman? Training by the ecstatic method is through visions and dreams. Often the apprentice spends months, even years in solitude living in a cave or forest in a most deplorable manner. This instruction is given by previous ancestors, spirits and guides and involves an initiation in the Otherworld. The conditions lend themselves to the ecstatic state through starvation and isolation. This is one reason why there are so few Shamans and why the lineage is not being continued in the hereditary manner. Traditional training is usually done by the current Shaman as he or she tries to produce an heir for the tribe. Often a Shaman will spend 20 or more years training his or her apprentice. The traditional training includes the names of spirits, history of the clan (tribe); herbalism and other skills Shamans need to do their work. Neo-Shamans sometimes try to glean the information they need from various books, seminars or Shamanic schools. They can however receive traditional training if they find the right teacher and are qualified to do so. In today’s world, there are fewer Shamans than ever before. The balance of the realities lies in the Shamanistic work being done. The lack of current Shamans is evident in the imbalance being seen in this world today. So the traditional teaching of apprentices is being allowed now by those few Shamans who have the proper mind and heart to keep the practice clear and focused on its own purpose. Please keep I mind that the path of Shamanism is not a hobby or something to be taken lightly. If one embarks on this path without guidance, protection, and the proper mindfulness, one can cause harm to others as well as themselves.